CEA - Collie Eye Anomaly - is an inherited condition affecting the eyes of a number of breeds of dogs. Affected breeds are the Rough and Smooth Collie, the Shetland Sheepdog, the Australian Shepherd, the Border Collie, the Lancashire Heeler, and the Nova Scotia Duck Tolling Retriever. The canine eye, cross section. Based on diagram in "Comparative Veterinary Histology", Aughey & Frye, 2001. Click to enlarge. In animals with CEA, there are abnormalities of the choroid (green in the diagram) and may also be changes in the sclera. The major change, which is present in all dogs with CEA, is 'choroidal hypoplasia', a pale patch in the back of the eye caused by abnormal development of the choroid layer. Affected dogs may also have abnormalities in the sclera, producing pits or 'colobomas' in or around the optic disk. What does CEA mean for my dog? 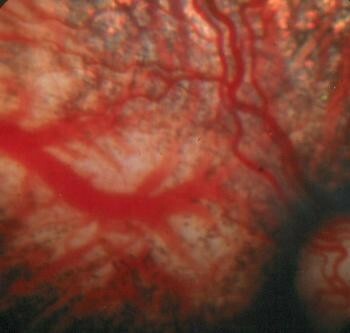 In the more severely affected animals with colobomas, there is a possibility that the retina may become detached, or that there may be bleeding from the blood vessels in the eye, either of which can cause blindness in the affected eye. These complications usually occur in the first couple of years of life. Mildly affected animals with only choroidal hypoplasia appear to have normal sight. The condition in mildly affected animals does not worsen over time. How can I find out if my dog has CEA? Examination of the eye by a veterinary ophthalmologist is the way CEA is primarily diagnosed. With an ophthalmoscope, the back of the eye (the 'fundus') will be examined, and the ophthalmologist will identify pale areas of choroidal hypoplasia, and the presence of any colobomas. CEA affected eye showing choroidal hypoplasia. Note the pale area to the left with the abnormally large vessel crossing it. Photo © Dr David L Williams, 2005. Used with permission. However, there is a feature of CEA known as the 'go normal' phenomenon, where the changes of CEA which are present in the young puppy are masked by later development in the eye as the puppy grows, so that a puppy which would have been diagnosed as affected at a young age appears normal when examined as an adult. These animals are still affected and still carry the genes for the condition. Because of this, it is important to screen litters before the age of eight weeks in order to get a clear diagnosis. Litter screening is an important part of any control programme for CEA, and responsible breeders will have this performed. Should I breed my CEA affected dog? Not in an ideal world. See the sections on Genetics and Control for more details.